Why Watch it Today? : John Ford was born on this date in 1894. 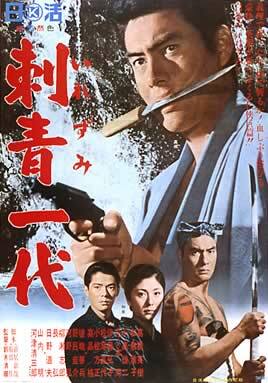 What’s that have to do with Tattooed Life, a Japanese Yakuza movie from the 1960s? Ford’s influence on cinema is enormous, and even reaches one of my favorite Japanese B-movie directors, Seijun Suzuki. Tattooed Life is about loyalty, honor, redemption, and brotherhood, both between the brothers themselves and within the construction crew recall the themes of much of Ford’s best films, with an uncharacteristically direct and simple style that matches the material. The foreman of the construction crew and Tetsu engage in a long fist fight that will make you think of the famous fight between John Wayne and Victor McLaglen in The Quiet Man. Seijun Suzuki fans will be relieved to know that the film ends in a characteristically colorful fashion that matches Suzkuki’s better known films. Other Choices: John Ford is one of my favorite directors, and I’ve featured his films many times on this blog. You can watch any of Ford’s Westerns The Searchers, Fort Apache, Stagecoach, 3 Godfathers, My Darling Clementine or Rio Grande; or one of his populist dramas such as The Grapes of Wrath and How Green Was My Valley. This entry was posted in Action, Crime, Drama, Movie of the Day, Period Film and tagged adultery, affair, artist model, between the wars, brothers, con artist, construction workers, double cross, Japan, Manchuria, Nikkatsu, on the lam, sabotage, samurai swords, Seijun Suzuki, tunnel, Yakuza, younger brother.